There's no way to prepare you for the insanity of Space Station 76. It's a comedy set in a mid-1970s version of the future that looks like Space: 1999. But it's also a surprisingly dark character study of people who are slowly falling apart, which owes a lot to The Ice Storm. Here's our nearly spoiler-free first impressions of this new movie. Space Station 76 made its premiere at South By Southwest in Austin, but we were lucky enough to see a screener of it separately. And this film made us really, really uncomfortable. It contains lots of huge laughs, which range from stoner humor to retro-futuristic 1970s spoofery — but then once it's pulled you in, it hits you with a lot of surprisingly dark, bleak humor. 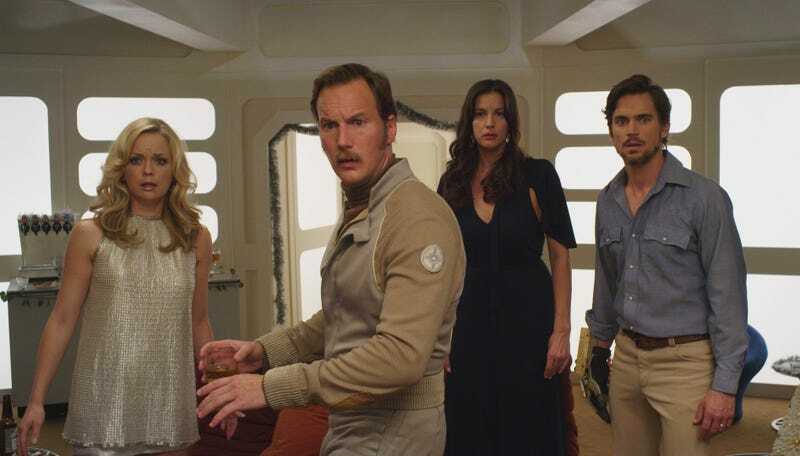 For example, Patrick Wilson plays Captain Glenn, the alcoholic commander of the space station — and at first, his alcoholism seems to be played for pretty broad comedy. But after a while, the film starts to engage with his alcoholism in a darker, more serious fashion, and it goes from funny to horrible. The basic plot of the film is only tangentially related to space travel, but the movie makes use of the setting in a lot of inventive, and sometimes breathtaking, ways — running character arcs include low-gravity floating, cryogenic freezing, and asteroid impacts. In Space Station 76, Liv Tyler plays Jessica, who comes aboard the space station as a new assistant captain, replacing Daniel, who left under somewhat mysterious circumstances. Everybody on the space station has weird secrets and hangups, and Jessica's arrival winds up stirring them all up. One of the standout scenes in the movie comes early on, as Jessica is talking to Misty, one of the wives on board the space station — and Misty is threatened by Jessica's career. So Misty keeps haranging Jessica about the fact that Jessica doesn't have children, until she makes Jessica really, really uncomfortable. The dialogue in this scene is so keenly observed and painfully awkward, it feels like you're eavesdropping on a real-life terrible conversation. In fact, a lot of the humor in this movie is more in Todd Solondz territory than, say, Mel Brooks or whatever. Some of the scenes in this film could have come straight out of Happiness, only set in a 1970s space station. The camera-work uses lots of Kubrickian wide shots of characters on their own in huge rooms, adding to the sense that these people are smaller than life in a larger-than-life situation.The future in this film also feels very lived-in and grungy — one character has a junky cybernetic hand that constantly malfunctions, and the space station's systems are constantly crapping out. It's interesting to compare Space Station 76 to Galaxy Quest, which was the last time someone spoofed a space opera with much real success. In both cases, there's a huge element of retro-futurism — Galaxy Quest focuses on 1980s visions of the future, through the lens of a fictional TV show, whereas Space Station 76 is clearly commenting on tons of representations from the era immediately before Star Wars. Also, both movies focus on broken men, who fail to embody the "Captain Kirk" archetype of starship captains. But imagine Galaxy Quest if Jason Nesmith spent most of the movie drunk and mired in intense self-loathing, and that's a lot closer to Space Station 76. There's a similar theme of play-acting and pretending in this film, but people are mostly play-acting at being competent adults, and failing miserably. Space Station 76 got some pretty mixed reviews from SXSW, and it's easy to see why. If you go into this film expecting a zany broad comedy, you're going to be horribly disappointed — and the cheesy 1970s trappings do lead you to expect more big laughs and fewer deep dives into psychological darkness. Plus the tone this film is attempting is a really tricky one — it's really hard to balance zany retro weirdness with intense emotional darkness, and this film does swing back and forth between light comedy and carefully observed drama. This kind of lurch from heavy drama to silliness is something that very few people pull off, and even when you do pull it off, not everybody is going to like it — playwright Christopher Durang talks about critics who hate to see absurdity mixed with intense painful drama in the introduction to his first collection Christopher Durang Explains it All for You, and this has never stopped being true. Luckily, Space Station 76 does pull of this weird blend of comedy and darkness, and if you can get into a movie with such a uniquely mixed tone, then you're in for something really unique here. The distribution rights to this film were just picked up by Sony, and we'll let you know if/when there's a release date.